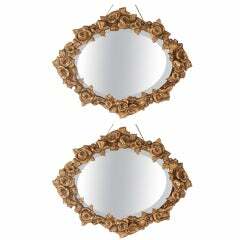 Venetian wall mirrors. Original 1950s oval shape and 360 degrees pivoting mirrors. Base is metal and the fruit wood. 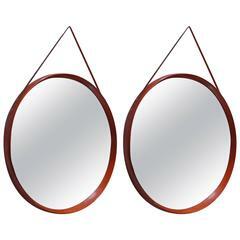 Italian pair of brass round mirrors by Sergio Mazza. 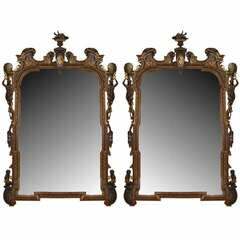 A stunning pair of large Italian shield mirrors, each with brass surround rectangular frame with the original "patina" of Time, 1950s. Price is for single a mirror. Very 1940s vintage. And there is a pair! Antiqued gilt over plaster, with a lovely beveled glass. Price is for the pair. 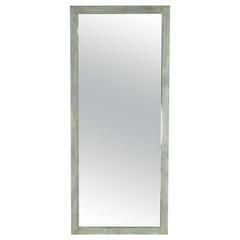 Thick and heavy gage patinated steel nicely welded together to form perfect solid and stylish mirror frame. Measures: 84" tall. 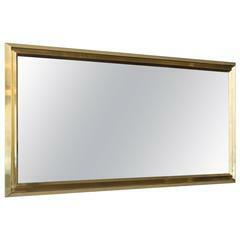 Pair of original old Italian midcentury wall mirror, original 1950s, side frame in shaped brass, original mirror.